A 7-year-old boy presented with angle-closure glaucoma, initially presumed to be idiopathic. A ciliary body mass was later detected on MR imaging, suggestive of medulloepithelioma but pathologically proved to be diffuse infiltrating retinoblastoma. We discuss the patient management and review the literature, with emphasis on the role of CT and MR imaging in evaluating pediatric angle-closure glaucoma and in influencing the management of patients with retinoblastoma and medulloepithelioma. Given that both can elevate intraocular pressures, imaging plays an important role in identifying neoplastic etiologies in children with angle-closure glaucoma. Furthermore, MR imaging defines the local extent of such lesions, profoundly impacting management. 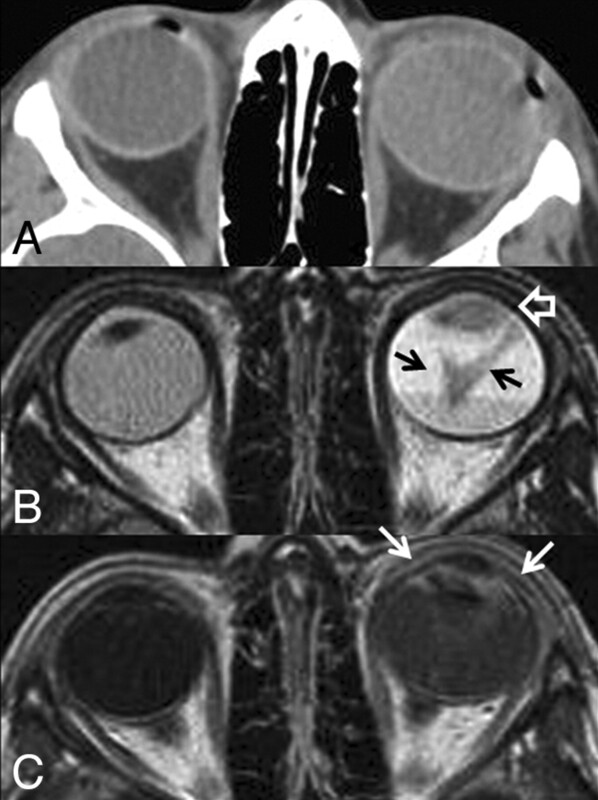 A 7-year-old boy presented with left orbital pain, decreased vision, and findings of cataracts and angle-closure glaucoma with unrevealing funduscopic examination and orbital sonography. Six months after undergoing an Ahmed anterior chamber shunt surgery procedure for presumed idiopathic angle-closure glaucoma, he developed a white anterior chamber mass, initially believed to be a hypopyon from presumed granulomatous uveitis. He then underwent a nonconjunctival-disrupting procedure with fine-needle aspiration. Cytologic analysis revealed small malignant cells with scant cytoplasm, positive for synaptophysin and chromogranin immunostains, yielding a preliminary diagnosis of retinoblastoma. 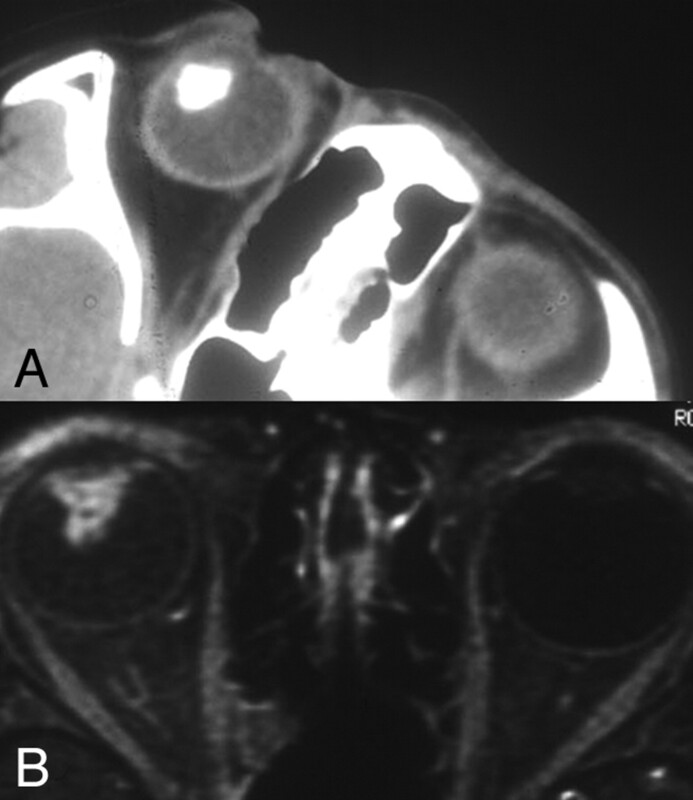 CT and MR imaging of the orbits demonstrated a noncalcified diffuse infiltrating mass involving a detached retina and anterior segment in the left globe (Fig 1), suggesting either advanced medulloepithelioma or diffuse infiltrating retinoblastoma. The patient subsequently underwent enucleation, providing a final pathologic diagnosis of retinoblastoma (Fig 2). A, CT scan of the orbits. The left globe is asymmetrically enlarged and is hyperattenuating compared with the contralateral right globe, reflective of glaucoma and total retinal detachment, respectively. No calcifications are present. B, Axial T2-weighted MR image. There is total retinal detachment with a large fluid-fluid level. The detached retina is irregular and diffusely thickened (black arrows), and there is an irregular intermediate-signal-intensity mass involving the ciliary body and iris circumferentially (open white arrow). C, Axial T1-weighted postcontrast MR image. There is diffuse enhancement of the thickened detached retina and the anterior segment mass (white arrows). This constellation of findings is consistent with diffuse infiltrating retinal neoplasm extending into the anterior ocular segment. There is no evidence of optic nerve invasion or extrascleral extension. Histologic section of the enucleated left globe. 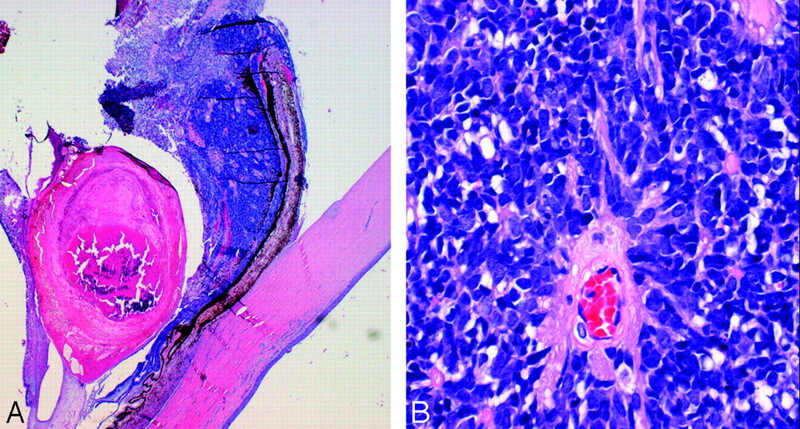 A, Photomicrograph (hematoxylin-eosin [HE] stain) of the whole-mount specimen at original magnification ×2. The ciliary body is diffusely infiltrated with neoplastic cells with round basophilic nuclei. The cells form rosettes around central lumens, known as Flexner-Wintersteiner rosettes, which are characteristic of retinoblastoma. B, Photomicrograph (HE stain) of the whole-mount specimen at original magnification ×40. The neoplastic cells have round basophilic nuclei with scant cytoplasm and are arranged in a rosette around a central lumen. Teratoid medulloepithelioma. A, Noncontrast axial CT scan shows a densely calcified mass of the ciliary body in the anterior segment of the right globe. Teratoid medulloepitheliomas can contain dystrophic calcifications due to the presence of hyaline cartilage tissue elements. B, Axial T1-weighted fat-saturated postcontrast MR image shows an enhancing mass of the ciliary body corresponding to the area of calcification on the CT scan. The mass is confined to the ciliary body; therefore, medulloepithelioma is more likely than diffuse infiltrating retinoblastoma. Alternative diagnoses for a ciliary body mass in pediatric patients include pyogenic granuloma, juvenile xanthogranuloma, mesoectodermal leiomyoma, and ciliary body cyst. Accepted after revision January 28, 2009.